d a n i e l l e b u r k l e o : is it too soon to decorate for valentine's day? is it too soon to decorate for valentine's day? i didn't think so. perhaps my nesting instincts are kicking in at 34 weeks pregnant? why yes, yes they are. and i haven't done a DIY on this here blog in forevah. we don't have a fireplace, mantel, or wonderful central place in our little house to decorate for holidays so i like to use these little built in shelves. they are just off the kitchen and peek through into the playroom. i love them. i do. so i'll tell you what we have here. 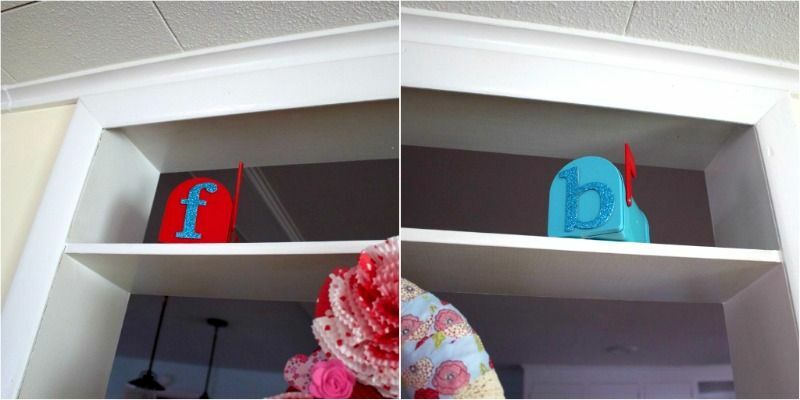 for starters are the valentine's day mailboxes for the boys. emily's mailboxes inspired me to create these for the boys. and when i say create i mean i hot glued a letter onto the front. emily's are much cuter with the candlestick they are mounted on. but, i don't have enough height for that. so initials it is! it will be fun for the boys to open up their valentines and little treats on february 14th. it is not the best thing to let your kids know they are loved? and while we are on the topic of valentines for kids, you should probably get their valentine's day cards right here. there couldn't be anything cuter. ps: the mailboxes are from target. dolla bins, people. what are you waiting for? i also decorated little mason jars. 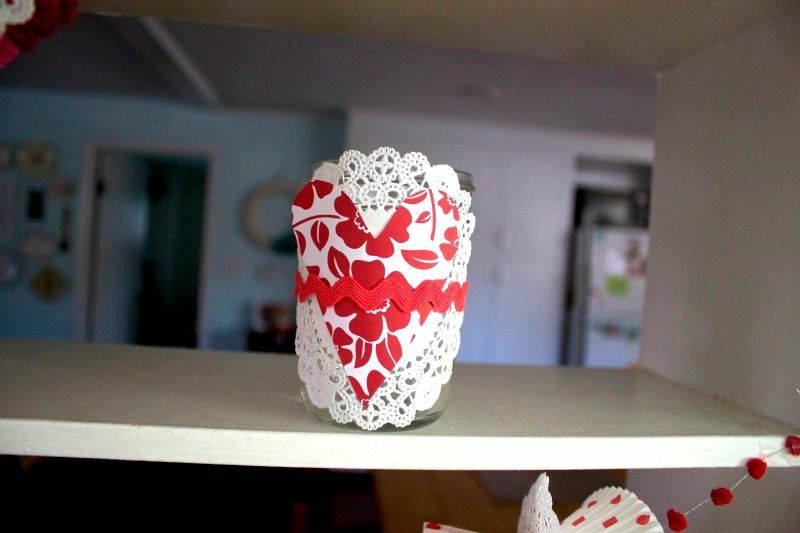 i just hot glued a doily and heart cut out from scrap book paper onto them and then topped them off by tying some rick rack around the jar. i knew i wanted to create something with cupcake liners but also wanted to use up some other stuff i had lying around. i wanted the wreath to be whimsy and fun, and i'm pretty happy with how it came out. supplies: straw wreath (leave the plastic on)… i always buy straw wreaths because they are a lot cheaper than foam. that's my only reason. cupcake liners, fabric, lace trim, chipboard letters, paper doily, button, yarn, felt, butons, and whatever other little embellishments your heart desires. these directions are going to be very vague, because i really just put stuff wherever. have fun with it. step 1: wrap yarn & fabric in places you would like it. step 2: add buttons and paper doily. - then fold up the bottom, put some hot glue on right there, and stick 'em on. i put mine in clusters, so they looked flower-ish. sort of. just go with it. step 4: glue on chipboard letters. step 5: add any other embellishments you would like. step 6: hang up and love. then i made a cupcake liner and paper doily garland. i had found this adorable little red pom pom wire on clearance at micheal's and had the awesome idea to use it for my garland. not thinking that i wouldn't even see it once they were stringed on or that it would be quite difficult to string the doilies and liners through. whatev. my hole punch would not fit onto the middle of the cupcake liners and doilies so my husband drilled a hole through them. whatever work, folks. whatever works. red cupcake liner, doily, red cupcake liner, white cupcake liner, doily, white cupcake liner. repeat a bajillion times. I passed the valentines section in the store today and it instantly got me in the spirit! your decorations are so awesome! I can't wait until my babies are older! I totally have v-day stuff out already!! I love decorating for this time of year!! 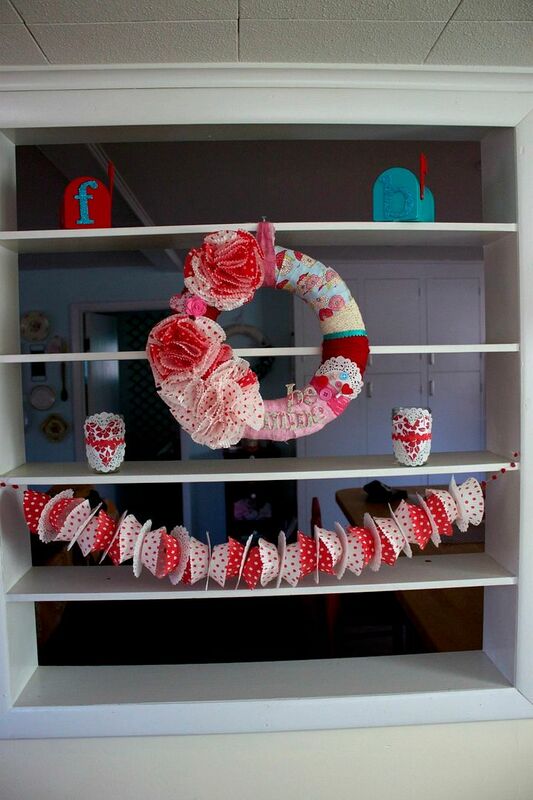 I love it all... the wreath is so cute and the mailboxes I'm going to get today. Saw them last week and passed them up but now I'm definitely getting! I LOVE these ideas! I am going to have to make flowers like those asap! I started decorating for valentines day as soon as I tore down Christmas decor. Love the wreath. LOVE! i am loving this! i cant wait to get to target to see if they have those sweet mailboxes! so cute! I just adore that wreath!!! I just discovered your blog! So cute and full of great DIY's! Love this one! I Just discovered your blog! SO cute and fill of great DIY's! I love this one! 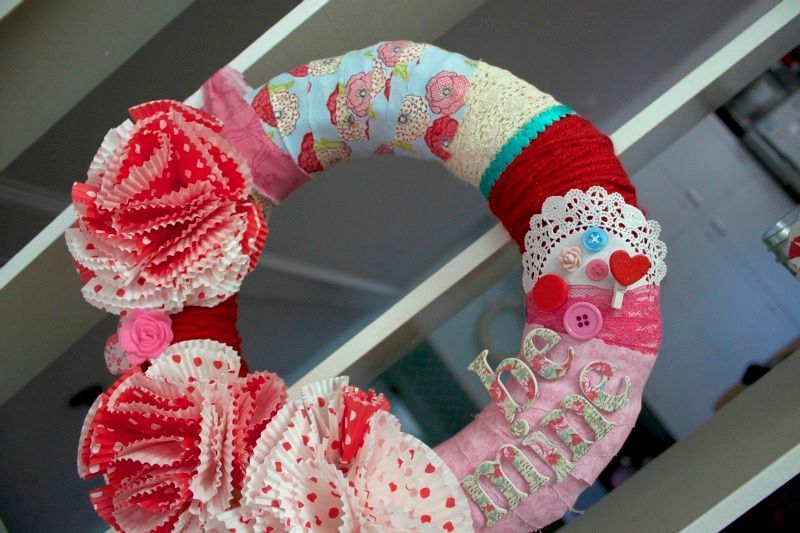 This is such a cute cute wreath! I love the colors! The Viral Site best decorative pieces.